Freestanding One Compartment Sinks With Left Drainboards Provide Increased Work Space Used For Storing Dirty Or Recently Cleaned Dinnerware. 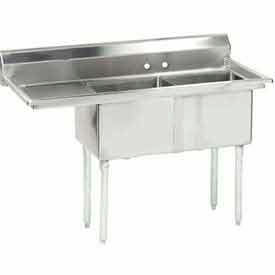 Freestanding One Compartment Sinks With Left Drainboards are made of 14, 16 or 18 gauge stainless steel for long lasting durability. Designed with full backsplash. Constructed with deep bowl depth and custom style fabricated bowl for true gauge integrity. Includes stainless steel tubing with adjustable impact resistant plastic or metal feet. Wrap around sink bowl ensures flat front for easy cleanup. Drainboard sloped toward sink allows water to run into sink. Easy assembly. NSF Listed. Color is Stainless Steel. Stainless steel series types are 304 and 304/430. Available in a variety of overall dimensions, drainboard lengths and compartment sizes. 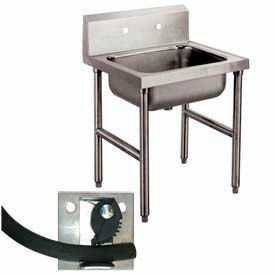 One Compartment Fabricated Sinks Are Used For Industrial Kitchens, Bars, Workshops And More. One Compartment Fabricated Sinks are TIG-welded stainless steel with gussets welded to a die-embossed reinforced plate for long lasting durability. Rolled edge provides added safety. 1" adjustable stainless steel bullet feet. Supply is 1/2" IPS hot and cold with faucet holes on 8" centers. Stainless steel basket drains are included. Sinks are available with drainboard on right. Overall lengths range from 20 in. - 59 in. Available in a variety of sizes. Freestanding Multiple Compartment Sinks Without Drainboards Are Designed For Heavy Foodservice Use In Commercial And Industrial Kitchens. Freestanding Multiple Compartment Sinks Without Drainboards are made with durable stainless steel for long lasting reliability and strength. Heliarc welded construction creates a uniform, rock-solid unit. Sinks include high backsplash. Hemmed exposed edges provide safety. Stainless steel gussets are machine welded to a stainless steel triangular plate. Gusset plates are fully welded directly underneath the sink for support. Legs have 1-inch adjustable, impact resistant plastic feet for stability. Dimensions vary per model. 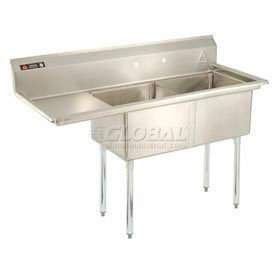 Stainless Steel Sinks Are Made With The Highest Quality Workmanship For Years Of Dependable Service. 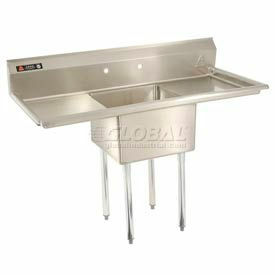 Stainless Steel Sinks are made using heavy gauge stainless steel that is corrosion resistant for long lastng durability. Sinks include high backsplash. Solid stainless steel wrap around sink bowl ensures flat front for easy clean-up. Hemmed exposed edges for safety. 8 inch off center faucet holes. Legs are made of stainless steel and include 1 inch adjustable, impact resistant plastic feet. Sinks are available with drainboards on Left to provide increased work space. Dimensions vary per model. 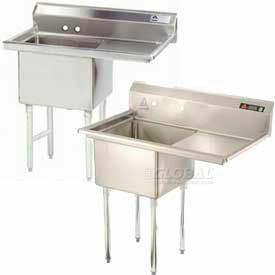 Freestanding One Compartment Sinks With Two Drainboards Provide Increased Work Space Used For Heavy Duty Commercial Use. Freestanding One Compartment Sinks With Two Drainboards are made of 14, 16 or 18 gauge stainless steel for long lasting durability. One-Compartment Sink designed with full backsplash. Constructed with deep bowl depth and custom style fabricated bowl for true gauge integrity. Includes stainless steel tubing with adjustable impact resistant plastic or metal feet. Wrap around sink bowl ensured flat front for easy cleanup. Drainboard sloped toward sink allows water to run into sink. Tile edge ensures easy installation. 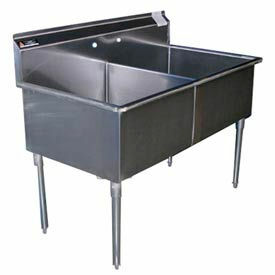 One-piece sink bowl includes left and right drainboards. Stainless steel series types are 304 and 304/430. Available in a variety of overall dimensions, drainboard lengths and compartment sizes. 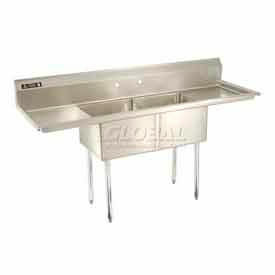 Freestanding Multiple Compartment Sinks Provide Plenty Of Work Space For Restaurant Kitchens Or Large Cooking Areas. Freestanding Multiple Compartment Sinks are made of corrosion resistant stainless steel for long lasting durability and reliability. Sink bowls are also stainless steel and with radius edges at intersecting planes. Sink includes high backsplash with 8 inch off-center faucet holes. Hemmed exposed edges provide additional safety. Gusset plates are fully welded directly underneath the sink for support. Legs include adjustable, impact resistant plastic feet. Sinks are available with drainboards on left or right side to provide increased work space. Dimensions vary per model. 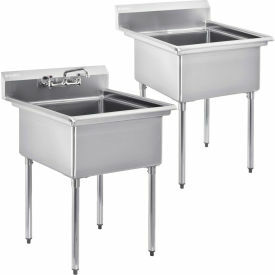 Freestanding Two Compartment Sinks With Left Drainboards Are Used For Applications Including Maintenance, Food Service, Hospitality, And More. Freestanding two compartment sinks with left drainboards are made of stainless steel for long lasting durability and corrosion resistance. Sinks allow ergonomic rinsing, cleaning, and overall content maintenance. Units feature deep basin and backsplash for spillage prevention. Includes adjustable metal feet for height versatility and impact resistance. Features fully welded gusset plates for added unit stability. Faucets sold separately. Easy assembly. Stainless steel gauges are 14, 16, and 18. NSF listed. Dimensions vary per model. 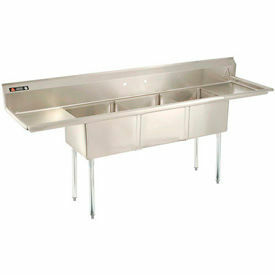 Freestanding Two Compartment Sinks With Two Drainboards Are Used For Applications Including Maintenance, Food Service, Hospitality, And More. Freestanding two compartment sinks with two drainboards are made of stainless steel for long lasting durability and corrosion resistance. Sinks allow ergonomic rinsing, cleaning, and overall content maintenance. Units feature deep basin and backsplash for spillage prevention. Includes adjustable metal feet for height versatility and impact resistance. Features fully welded gusset plates for added unit stability. Faucets sold separately. Easy assembly. Stainless steel gauges are 14, 16, and 18. Stainless steel series are 304, 304/430, and T-304. NSF listed. Dimensions vary per model. 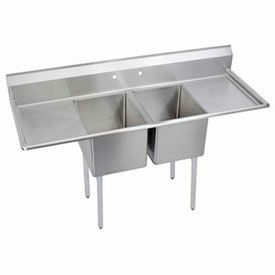 Freestanding Three Compartment Sinks Provide Plenty Of Work Space For Restaurant Kitchens Or Large Cooking Areas. Freestanding Three Compartment Sinks are made of corrosion resistant stainless steel for long lasting durability and reliability. Sink bowls are also stainless steel and with radius edges at intersecting planes. Sink includes high backsplash with 8 inch off-center faucet holes. Hemmed exposed edges provide additional safety. Gusset plates are fully welded directly underneath the sink for support. Legs include adjustable, impact resistant plastic feet. 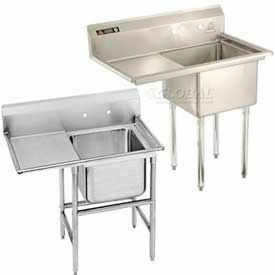 Sinks are available with drainboards on left or right side to provide increased work space. Dimensions vary per model. NSF Fabricated 1 Compartment Sink, 18L x 18W Bowl, 8-1/2 Splash, 24H Left Drainboard, 16Ga. NSF Fabricated 3 Compart. Sink, 20L x 30W Bowl, 8-1/2H Splash, 20L Left & Right Drainboards, 16 Ga.